Well bejabers and begorra, och aye the noo, isn’t it dai bach, why aye man, ah’ll sithee and the top of the morning to youse all; happy Saint Patrick’s Day, look you boyo, hoots mon. And now we’ve got that over and done with, let’s get on with this week’s blog. Hmm... more like a trombone, I reckon. The greatest gift that I possess. That was the beginning of Happiness, a song that provided mucky-minded schoolboys throughout Britain with their idea of a smutty joke. So, the grand old man of stage comedy died this week. [Did he? No, Doddy. D’you geddit? - Ed.] Ahem. Thank you for that other example of a schoolboy joke. Ken Dodd was 90 when he died this week, yet he was still performing his legendary marathon stage shows until just a few weeks ago. Those shows were indeed marathons. I realised a lifetime’s ambition to see him perform some years back when he was in his late seventies. He came onto the stage at 7.00pm and left at 10.00pm... for an interval! After a half hour’s support act, he was back on stage for another two and a half hours. It was 1am when I left that theatre. I was lucky to get out alive, I can tell you. His opening gag should have warned me... ‘What date is it?’ shouted Ken Dodd. When an audience member shouted the answer, Doddy responded with, ‘It is now!’ the inference being that we were in for the long haul. Come on. That just isn’t funny. It doesn’t look in the least bit amusing written down like that, but when Dodd shouted it out, it just seemed hilarious. Performing was Dodd’s life. Those five hour shows would be performed night after night, week after week; he rarely took a break. What I didn’t realise at the time was that it was Eddie Braben that had written all these surreal jokes; to me, it was all Doddy’s work and he was a genius. As I stated earlier, he did like to recycle material. Were any famous or notorious people born on the 17th of March? Of course. Here are some I’ve even heard of. Gottlieb Daimler 1834 (Pioneer of internal combustion engine. Does his name really translate as dear god? What were his parents thinking? ), Lawrence ‘Titus’ Oates 1880 (Explorer. ), Alfred Newman 1901 (Composer, mainly of film music. He was Oscar nominated 44 times and won on 10 occasions. Here’s one you might know. How exactly do you splendour love? ), Bobby Jones 1902 (Golfy bloke. ), Ray Ellington 1915 (Singer on The Goon Show. Er... that’s it. Not quite; this was a minor hit for him in the early sixties. Here is The Madison. ), Nat ‘King’ Cole 1919 (Musician. Another clip? Here he is eulogising about a bit of tarmac. Crikey, they made suits big in those days! ), Rudolf Nureyev 1938 (Hoofer. ), Robin Knox-Johnston 1939 (Hello sailor. ), Giovanni Trapattoni 1939 (Footy bloke. Known as Il Trap. ), Paul Kantner 1941 (A bit of Jefferson Airplane/Jefferson Starship. You would like another clip? Okay, time to don your tie dye and trip out... here’s White Rabbit. ), Jeff Banks 1943 (Fashion designer and rhyming slang. ), Pattie Boyd 1944 (Clothes horse. Had two very famous songs written about her - this one and this one. ), John Sebastion 1944 (A quarter of a spoonful. Have another clip. Here’s Daydream. ), Alex MacDonald 1948 (Footy bloke. ), Patrick Duffy 1949 (Actor. Came back from the dead in Dallas. Er... that’s it. ), Pat Rice 1949 (Footy bloke and Elton John impressionist. ), Scott Gorham 1951 (A bit of Thin Lizzy. Another clip? Here’s Jailbreak. Daft lyrics or what? Tonight there’s going to be a jailbreak somewhere in this town... Not the jail, then? ), Kurt Russell 1951 (Tree. ), Lesley-Anne Down 1954 (Ectress. She was in Upstairs Downstairs. Er... that’s it. As far as us Brits are concerned. She’s in a few minor US productions. ), Rory McGrath 1956 (Comedian and writer. Here’s a little story gleaned from Wikipedia... McGrath supports Arsenal. He and fellow comedian Peter Cook (a Tottenham supporter) used to have a friendly rivalry over their respective clubs. On the night that Cook died in January 1995, Tottenham had beaten Arsenal. McGrath found out about his friend's death after failing to receive Cook's usual abusive phonecall the next morning. ), Claire Grogan 1962 (Actress and singer. She used to be an Altered Image. Have a clip. I could be happy, but not with that dreadful video. ), Lee Dixon 1964 (Footy bloke and Martina Navratilova impressionist. ), Rob Lowe 1964 (Actor. Don’t mention that video tape. ), Billy Corgan 1967 (A Smashing Pumpkin. A clip? Here’s Tonight, Tonight. 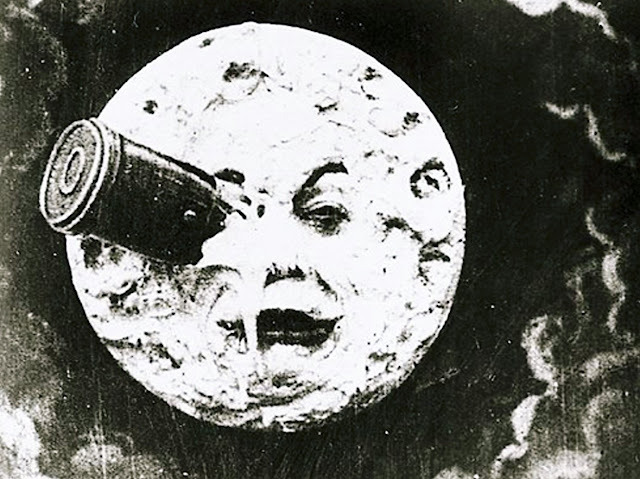 The video is a brilliant tribute to Georges Melies, the great film pioneer. ), Alexander McQueen 1969 (Fashion designer. ), Caroline Corr 1973 (Drummy Corr. Another clip? What can I do? ), Justin Hawkins 1975 (A bit of the Darkness. Another clip? Go on then... but not that one. Here’s Love is Only a Feeling Love is Only a Feeling. Make your mind up! It was like a violin earlier. ), Steven Pienaar 1982 (Sokkerspeler. ), Raul Meireles 1983 (Futebolista. ), Fraser Forster 1988 (Footy bloke.) and Shinji Kagawa 1989 (Footy broke.). You gave us a clip to a Jefferson Airplane song, White Rabbit. I’ve always been a big fan. Or should I say, I’ve always been a small fan, because I’m quite small. LOL. Anyway, did you know that Paul Kantner was the only remaining founding member when he left the band in 1984? Apparently, he took legal action against his former band ‘mates’ over the rights to the band name. The action was settled out of court, but the names ‘Jefferson’ or ‘Airplane’ were not to be used without all other remaining band members’ permission. Thus, to avoid upsetting him further perhaps, the band that was formed after his departure was called simply ‘Starship’. They actually had a few hits after that. The first one was a real biggie. Unfortunately I can’t remember the name of it. Can you help? Bradley Dack broke the deadlock in first-half stoppage-time and two second-half goals from in-form Adam Armstrong settled proceedings. The hosts went ahead in the 34th minutes when Northampton goalkeeper Richard O'Donnell parried a shot from inside the box by Ellis Harrison, only for Kyle Bennett to latch onto the rebound and net from close range. But Luckassen headed the Cobblers level after 62 minutes within moments of going on, rising to convert Brendan Moloney's right-wing cross. Northampton had midfielder Matt Crooks sent off after 74 minutes for a second yellow card after he clattered into Stuart Sinclair. And the visitors were grateful to a fine late save from O'Donnell to keep out Dominic Telford's low drive. They might have been grateful, but I’m not! Jamal Lowe gave Pompey a 19th-minute lead when he fired a close-range effort into the roof of the net. And the 23-year-old should have doubled his side's advantage just before the half-hour mark when he was in on goal but Gillingham defender Luke O'Neill got back to make a last-ditch tackle. The visitors struck back through half-time substitute Conor Wilkinson in the 48th minute after he took a touch to set himself up before curling his shot into the bottom corner. The Gills then took the lead through Lee Martin when his free-kick managed to drift past everyone and find the back of the net. And Martin got his second and secured all three points for the away side with a spectacular goal in the 80th minute, the Gillingham captain curling the ball into the top corner from outside the area. Rotherham's Marek Rodak made the first save of the game as he rushed out to deny Andrew Cannon. The visitors threatened again through Humphrys but his shot was diverted wide of goal. Rotherham thought they would have a half-time lead but Richard Wood's header was disallowed for a foul on Josh Lillis. Rochdale's Brad Inman was denied early in the second half by another good stop from Rodak after bursting clear of the defence. The away side deservedly went ahead after 67 minutes when Stephen Humphrys lashed a shot into the bottom corner following a rapid build-up. Joe Mattock denied Ian Henderson a good chance for a second with a well-timed tackle in the box. Semi Ajayi's late effort for Rotherham was cleared off the line and Rochdale hung on. Shrewsbury were rewarded for a bright start with a sixth-minute breakthrough as Alex Rodman converted Jon Nolan's inviting low cross from the right. The hosts nearly added to their lead shortly afterwards but Carlton Morris struck the post from Shaun Whalley's cross. Then the influential Nolan hammered a powerful 20-yard drive over the bar. Walsall were also lively going forward and Dean Henderson, the Shrewsbury goalkeeper, had to be alert to tip a Kieron Morris header over the bar. Nicky Devlin then went close to an equaliser when he burst into the box and fired against the near post from a narrow angle before Erhun Oztumer was off-target from a 25-yard free kick. Walsall's Liam Leahy headed against the woodwork in the closing stages before Shrewsbury doubled their lead in the 88th minute as skipper Abu Ogogo swept home Rodman's cross from the right. Oh dear. All away predictions. I foresee a few draws. I also foresee a lack of match reports next week as some of those predictions come from the lower reaches of the Scottish leagues and, as you all know, the Beeb Beeb Ceeb tend to ignore those. Even more whopping than last week. So instead of not winning £10.73, we won’t win £11.82. Teaser time. Yay! Last week I asked you which Portuguese player had won the most Premiershit League title medals. Who said Ronaldo? Wrong! He only won three. The answer is Luis Carlos Almeida da Cunha. Who the fu... Who is that? He is better known as Nani. He spent eight seasons with the Manchester United side that won the league on four occasions. ‘You think you can get away, but you can't. I'll follow you home and I'll shout jokes through your letterbox’ - when he was still going strong at a show as it approached midnight.